Sacramento — This morning, Governor Jerry Brown released California’s 2017-18 revised budget – a budget that increases total funding on corrections to $11.4 billion (2017-18), up from $10.6 billion last year (2016-17). Brown’s increase in corrections spending falls out of step with the will of the people of California. The budget projects a decline of the adult prison population by .7% due to voter mandated criminal justice reforms like Proposition 57, yet, the California Department of Corrections and Rehabilitation budget continues to soar at an all time high this year. In a moment where California’s values are under threat by the federal government, the state cannot afford to drain its social safety net to expand prisons and jails. Over 64% of California voters have already taken a stand against wasteful spending by passing Prop 57 last fall, however the savings are offset by the Governor’s budget. The budget estimates that Prop 57 will reduce the average daily population by approximately 2,000 in 2017-18 with result in net savings of $38.8 million in 2017-18, yet the total corrections budget increases by an all time high of $600 million. 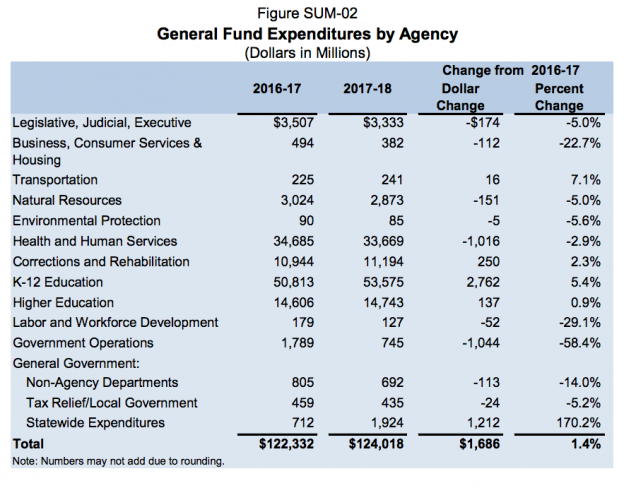 Despite these spending increases, CDCR insists on neutering the potential cost saving effects of Prop 57 by refusing to implement retroactivity, expanding credits to non-violent third strikers and applying credits to the earliest possible parole dates. As the budget is finalized, advocates turn to legislative budget leaders, encouraging them to with Prop 57 regulations. Arguing that by fully implementing the will of California voters to reduce mass incarceration millions of dollars in savings could be realized. “In the Senate Budget committee hearing Senator Skinner asked Secretary Scott why CDCR won’t implement retroactivity. He stated that it was because CDCR did not have the capacity to do so. The Governor’s revised budget allots an additional $1 million to implement Prop 57. We strongly recommend CDCR use this additional funding to implement retroactive milestone earning credits” said, Charles Berry, board member of Initiate Justice, a member organization of Californians United for a Responsible Budget. In addition to full implementation of voter-mandated reforms, state legislators are still concerned about California’s deadly prison and jail overcrowding and are pursuing further common sense sentencing reforms like SB 180 (RISE Act). Authored by Senator Mitchell, the RISE Act would repeal an enhancement for prior drug convictions. Experts believe these enhancements have contributed to jail and prison overcrowding, and do little or nothing to deter drug sales. Donald Trump’s repeal of federal reforms, like Obamacare, are well underway, and his threats to withhold federal funds from states that refuse to comply with his aggressive immigration policies continue. Governor Brown’s budget and press conference shared no plan if a major federal financial hit impacted California like the possible repeal of the Affordable Care Act. The people of California, progressive legislators and the CURB coalition believe that the appropriate response to looming budget threats is not more wasteful spending on incarceration, but commonsense reforms coupled with a reduction in corrections spending. California should continue to pursue aggressive parole and sentencing reform efforts and repeal all prison and jail expansion efforts. CURB will be joining the California Partnership at a series of statewide press conferences to respond to today’s budget. This entry was posted in information, news, true stories and tagged california budget, mass incarceration, prison reform on May 12, 2017 by demotropolis.